Ancient Rome - The Romans enthusiastically celebrated birthdays with hedonistic parties and generous presents. China - Chinese birthday traditions reflect the culture's deep-seated focus on longevity. Christianity - Early: Origen wrote that Christians should not only refrain from celebrating their birthdays, but should look on them with disgust. Christianity - Orthodox: Still prefers the celebration of name days only. Christianity - Medieval: Ordinary folk celebrated their saint's day (the saint they were named after), but nobility celebrated the anniversary of their birth. 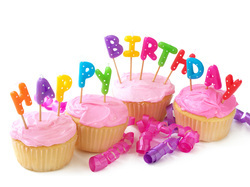 Christianity - Modern: Some groups refrain from celebrating birthdays. They believe that birthday celebrations are portrayed in a negative light in the Bible and have historical connections with magic, superstitions, and Paganism. Witchcraft - Many (if not all) of our Birthday traditions stem from the 'Candle Magic' Rituals of Paganism and Witchcraft. (SEE - Candle Magic for more info). Judaism - In the Hebrew Bible, the one single mention of a celebration being held in commemoration of someone's day of birth is for the Egyptian Pharaoh which is recorded in Genesis 40:20. The bar mitzvah of 13-year-old Jewish boys, or bat mitzvah for 12-year-old Jewish girls, is perhaps the only Jewish celebration undertaken in what is often perceived to be in conjunction with a birthday. Islam - Some clerics consider the celebration of a birthday to be a sin, as it is considered an "innovation" of the faith, while other clerics have stated that the celebration of a birthday is permissible. Hindus - Hindus celebrate the birth anniversary day every year when the day that corresponds to lunar month or solar month of birth. (Sun or Star Signs / asterism). Buddhism - Many monasteries celebrate the anniversary of Buddha's birth, usually in a highly formal, ritualized manner. They treat Buddha's statue as if it were alive, bathing, and "feeding" it.